Rhodes is the ‘Shoprite Big Brand supplier of the Year’ in the Ambient Groceries category. Every year the Shoprite Group of Companies recognises suppliers for their continued support and co-operative relationship at the ‘Big Brand Supplier of the Year’ function. The Shoprite Group of Companies paid tribute to their suppliers at a glamorous annual awards ceremony held at the CEO, Whitey Basson’s, wine farm in Stellenbosch on Saturday, 26 November 2011. About 1000 guests attended this prestigious event. This was an initiative embarked upon by the Shoprite Group of Companies eight years ago in recognition of the vital role that its suppliers play in the retailer’s efforts to continually grow its business and increase service levels to its customers. However, it also serves as an internal benchmark for the Group in upholding consistent service levels to the South African consumer. 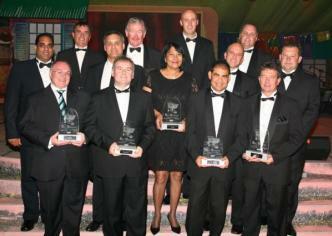 The Shoprite ‘Big Brand Supplier of the Year’ Awards has grown into a credible accolade that is accepted with pride. In 2011 this honour went to Rhodes in the Ambient Groceries category and Gareth Ramsden, National Commercial Manager, accepted the award. Rhodes won four out of five regions in the Ambient Groceries category, including Free State, Gauteng, KZN and Western Cape. Well done to Quentin Stanfliet and Jessie Reddy for their regional accolades. Front row (L to R): Jeff Borstrock (CEO Award Recipient: Jeffart Signs (Pty) Ltd), Thomy de Charmoy (Toiletries category winner: Unilever), Faeesa Adams (Contractors/service providers category winner: Salient), Shaun van Reenen (Confectionery and Beverages category winner: Simba) and George Maxted (Fruit and Vegetables category winner: Harvest Fresh). Back row (L to R): Salim Karsan (Housebrands/Private Labels category winner: Heartland Foods), Michael Metz (Furniture category winner: Restonic), Deon Calthorpe (Perishables and Service Departments category: Willowton Group), Geoff Brownell (CEO Award Recipient: Tilespace), Danie Bierman (Upcoming Suppliers category winner: Eagles Valley Poultry), Gareth Ramsden (Ambient Groceries category winner: Rhodes Food Group (Pty) Ltd), Gary Crouser (Non-Foods category winner: Control Chemicals (Pty) Ltd) and Jack Miles (Meat Markets category winner: Meat Traders).